"These fried spiced plantains are a favorite snack in the West African country of Ghana." Heat oil in a deep-fryer or large saucepan to 350 degrees F (175 degrees C). Place plantains in a bowl. Puree onion in a blender until smooth. Stir in ginger and cloves; pour mixture over the plantains. Mix in ground chile pepper and salt. Stir to coat plantains. Place plantains in the hot oil; fry until browned on all sides, about 5 minutes. Drain on paper towels. 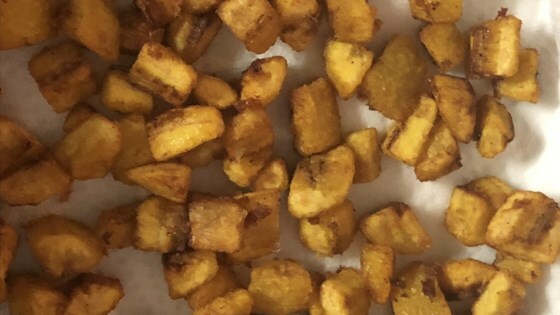 See how to make fried sweet plantains. Yellow plantains are also suitable to use. Onion may be grated or blended.